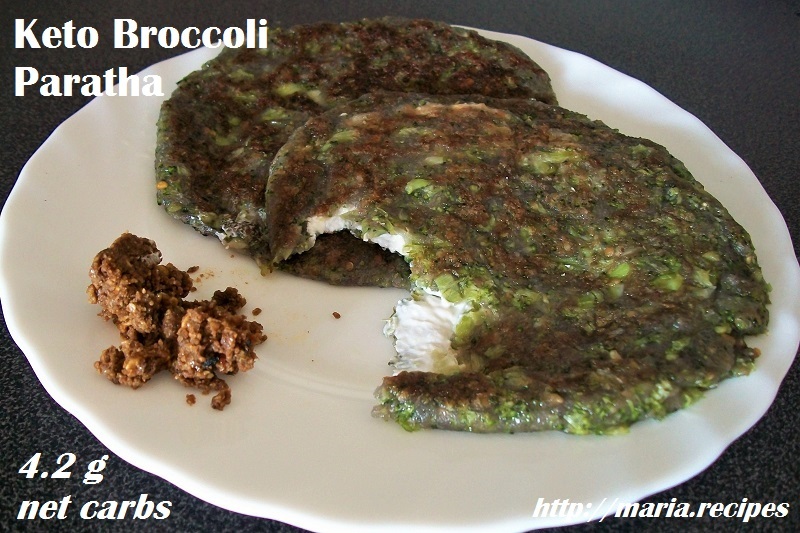 A simple, 5 ingredient recipe to make broccoli parathas stuffed with cream cheese. They are amazing with some pickle for breakfast! And if you are vegan, you can use some almond cream cheese instead of regular cream cheese. Cook the broccoli (boil or steam) until fork tender, without overcooking so it doesnt lose the green color. Blend the broccoli with 2 tbsp water. Add the psyllium husk powder and salt to the broccoli puree, along with other spices if you want (some garlic powder and onion powder could be great!) and mix until you have a dough. Using a chakla or a rolling pin (i like to cover my surface with plastic wrap to avoid any stickiness - by putting a bit of water on the surface first, the plastic wrap won’t move when you roll), roll each part into a very thin disk of about 1 mm thickness. Take a disk, spread 2 tbsp cheese on it, then put another disk on top. Pinch the edges to seal. Melt 1 tsp of ghee on a non stick pan over medium high heat. Cook the paratha for 3-4 minutes on one side until it is brown, then filp and cook further 2-3 minutes. Cook all four parathas this way and serve with a low carb pickle.